Dial in on pizza and salad at Madison's grandest old Italian joint. The Lombardino's Caesar salad: Sensual, tactile, and animalistic. Photos by Adam Powell. After an initial run on State Street, Matteo Lombardino set up shop on University Avenue in 1952, festooning the exterior with psychedelic murals and the interior with strange Roman statuary and painted tiles. Lo, a cultural institution was born, suitable for an intimate tete-a-tete, a family celebration, a culinary educational jaunt, or a psilocybin-informed stop (the murals really do bear close inspection, the kind of attention mushroom afficionados can bring to bear) on the way to Picnic Point; this is a landmark that has passed a 66-year run of operations in one location, formidable for any Madison restaurant. In 2000 the ownership changed and chef Patrick O'Halloran transformed what had become a bit of a grim slog through tired red sauces and clam linguine into a totally new menu, powered by locally sourced, "farm-to-table" ingredients, and pitching his approach as "the way Italians would cook if they lived in Wisconsin." Today Lombardino's is one of Madison's most reliable upscale Italian eateries, along with Osteria Papavero and Greenbush Bar. With a little savvy, you too can sup on the crushed garlic cloves of Lombardino's sweet sauces without crushing your wallet. Part the curtains, shielding the sanctuary from harsh winter winds, and you pass into a room of velvet and stone that calls for a glass of Italian wine. Pinot Grigio Cantina Le Monde, 2016, has the nose one gets in an orchard, and tastes of green apple: it's tart, bright, noisey, and almost harsh (well, it's the cheapest glass on the menu). The Orvieto "Amabile" Bigi 2016 Umbria is flinty, with a mineral bite and stoney undercurrents. Both are passable table wines. The bread is not so very good (we are spoiled by Batch and Madison Sourdough at this point, but to be fair, it is no mean feat to keep up with our ever-expanding notions of what constitutes good bread in Madison) but it's free. Ask for freshly ground black pepper for the olive oil and dip away. If nothing else it helps you fill up, so let's not have any complaints. Now for the good stuff: Lombardino's has the best Caesar salad in Madison. Topped with a majestic anchovy, lightly dressed in lemon, covered in a billow of freshly shaved parmesan, this superb treatment is garnished with a drizzle of olive tapenade and a salted hard-boiled egg to make for an ideal first course. It's sensual, tactile, salty and the anchovy is animalistic; this salad will make you feel wide awake and totally alive. The Margherita is the highlight of Lombardino's pizza menu. 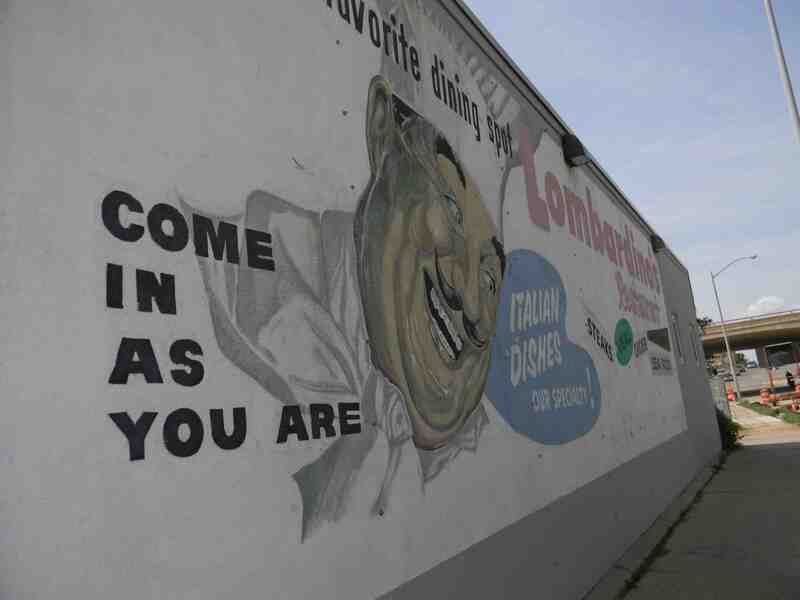 Planning notes: Lombardino's is packed on weekend nights; sometimes you can wrangle a seat up at the bar but don't count on it. We got a nice recessed booth, however, quite romantic, without a reservation, on a Tuesday night. The room is softly lit with soft multipoint lights and ornate table lamps, like a small cave in Rome where nothing has changed in 50 years. The famous statuary is augmented by fascinating tile paintings, the latter all relics of the original incarnation. Conversation is easy and there's no shouting. The staff is totally pro, taking the time to split entrees and appetizers without being asked. Also within reach: For those who are really hungry, split an order of the filling Tuscan white bean soup, with Nueske's bacon hunks, chunks of day-old of bread, and an undercurrent of sage. Bread-crumbed and deep-fried calamari is a big hit here and for good reason; the lemon-dusted tentacles open up new taste buds you didn't know you had and make you feel ways you didn't know you could. Stretch goals: Lombardino's does pizza bellissima, but has excellent pastas as well: witness the orecchiette with Fraboni's sausage and roasted garlic cream ($18), the ricotta agnolotti and duck ragu with olives and pecorino ($23), and the carbonara with pancetta ($20). Now, if we're talking expense account or visiting relatives willing to pick up the bill: the beef tenderloin, cooked on the aforementioned house wood grill with smoked bacon ($38), the Pinn Oak Ridge lamb chops ($39) or the 18-ounce ribeye with grilled fingerling potatoes ($43) all fit somebody else's bill just fine.